I am not a fan of most lunch foods. I’m very particular about sandwiches, which must have the right proportion of bread to filling (otherwise known as the “squish” factor), and there aren’t very many types of lunch meats that I like. Pretty much it’s either going to be peanut butter and honey, turkey, egg salad, or tuna. The latter two need to be made well in advance of lunch, because otherwise they aren’t cold enough for my taste. I kept hearing raves about imported Italian oil-packed tuna, and how far superior it was to domestic water-packed albacore. So when we got up to Whole Foods and found oil-packed Italian tuna, I was eager to try it out and see what the fuss was all about. It didn’t seem right to use it with my go-to tuna salad for sandwiches, or even Jeremy’s favorite tuna pasta salad with peas and dill, so I started paging through my copy of Essentials of Classic Italian Cooking and hit on her tuna and bean salad. I used one can of the Italian tuna, drained, one can of drained and rinsed white navy beans, and half a yellow onion, chopped up rather finely. With the salt, pepper, olive oil and a splash of red wine vinegar, it came together as much more than the sum of its few parts. 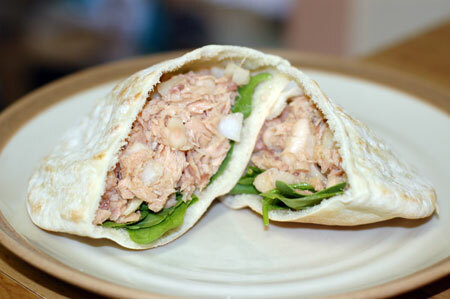 The beans and olive oil were a perfect creamy substitute for mayonnaise, and the tuna really was wonderful and flavorful. Jeremy said it was alright after the first forkful, and after a few more bites, that it was really growing on him. This was so quick and easy, made with pantry ingredients (and yes, we will always have some of that imported tuna on hand from now on), and no need for refrigeration before eating. Absolutely a good light meal, either for lunch or a summery dinner, and perfectly accompanied with a balsamic vinaigrette salad. Drain and rinse the beans in a sieve; drain off all excess water. Place in a medium-sized bowl and add the tuna, drained and broken up, and the onion, finely chopped. Stir well and sprinkle with about 1/2 tsp kosher salt or to taste; grind fresh pepper over. Drizzle with olive oil just to coat, several tablespoons; add a splash of red wine vinegar, around 1 tablespoon, and toss all well to coat. Serve at room temperature, with a green salad and/or bruschetta. Source: Adapted from Marcella Hazan’s Essentials of Classic Italian Cooking . Update 11/27/06: Last night I made this salad with some bruschetta from our last little baguette of pain a l’ancienne (leftover from just before Thanksgiving), sliced on the diagonal and quickly toasted on the griddle, then rubbed with raw garlic and drizzled with a touch of olive oil. A perfect medium for the salad and an excellent use of slightly stale but still tasty bread. Update 1/3/07: We made this salad for lunch in the first few days we were home in Colorado for Christmas. We used actual cannellini beans, and they added a lovely creamy, buttery flavor that navy beans just can’t manage. I really wish we could find some canned ones around here, but no dice. We’ll just have to wait and check out Whole Foods. Update 1/29/07: Made this for a weekend lunch, served with toasted English muffins as a delivery vehicle. I no longer need the recipe to make this salad, and we find it necessary to always have a stock of imported tuna and canned beans at the ready. Update June 2007: I made this for another weekend lunch, using imported Italian cannellini beans and stuffing it into some leftover pitas with baby spinach. An easy and tasty delivery method for this salad. Update 8/25/07: Another delivery method for this salad today: we used hearts of romaine as little boats. Worked rather well, too. Also made this a week or two ago when I didn’t have any onion, and used shallot instead… wouldn’t recommend that, as it was awfully pungent. Update 2/27/09: I made this for lunch today because the fridge and pantry were getting really bare; had to use water-packed albacore instead of the imported stuff. I just added some extra olive oil and it tasted fine. Jeremy offered some to Nolan, and he turned out to really love it, despite making a funny face after the first bite; we just avoided giving him the raw onion because it isn’t so much gummable.